The Hideaway - Clean, Comfy, Affordable & Close To All The Fun. 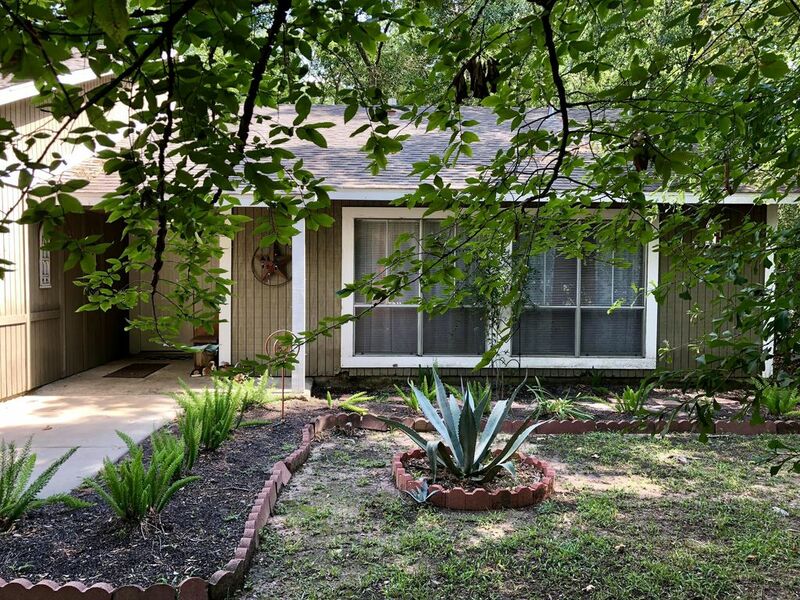 One story home on a private corner lot with 3 bedrooms and 2 bathrooms. Master bedroom in back has a California King bed and its own attached small bathroom. Guest room/Lamb room has a double bed and lots of sheep to count as you fall asleep. Black & White room has a Queen bed. There is a small guest bathroom with a tub and shower in the hall. There is a deck behind house to watch the birds, the rabbit, the squirrels and listen for our neighborhood owls. 2 car garage, and small covered patio out front, OPEN FLOOR PLAN to hang out with your family for TV, or games, or meals. The Humble Hideaway reminds us of the motto - Always stay humble and kind. Amen. toilet, shower, A small bathroom is inside of the master bedroom. toilet, combination tub/shower, The Hall Bath is blue, and all about the Ocean. The bathrooms are small. They serve their purpose but are nothing fancy. There is room for 2 cars in the driveway, and parking for ONE car is allowed on the street. No space to park in garage - it is reserved for vehicles we use in our business. yep - of course, who does their own dishes anymore?? Everything you want is here, and if you need something else, we are next door to bring it to you. 2 TV's with basic cable. i love to read, more books are always available at the library 2 miles away. There is additional charge for guests over 6 people. The house is smallish and best fits 6 people. We were on a 1 week business trip that turned into two then three. Sara was excellent! Extremely attentive and quick to respond. The home is very comfortable and is tucked away in the woodlands but dose not lack on shoping and dining amenities of all kind, including a fantastic mall no more than 5 minutes away. The home is well equipped for those that like to cook. This is perfect for business and family trips. I hope to return with my family soon. Thank you Sara for making everything easy. Mauricio was a pleasure to host. Always polite & easy to communicate with. He is welcome back. Clean, nice & roomy, easy to get to, and the owner was fantastic! Communicated great & quickly! Our pleasure to host positive people, like you. Thanks! The house was in a quiet neighborhood. It was clean. It had all the accessories we needed for our stay. I highly recommend this house! Thanks for staying with us. It was a pleasure to host your family at our Hiseaway. Comfortable, clean, and great location! We thoroughly enjoyed our stay at The Hideaway. Sara was great and the house had everything we needed to make our stay comfortable. The beds were cozy, the kitchen had everything we needed, and the back yard and neighborhood were charming. Great location, well-maintained home with a great gathering space! This is a really nice 3-bedroom home with outdoor deck and lots of seating in the family room. Kitchen is conveniently open to living space and all the appliances are in really good condition. Owners were very accommodating and nearby if you needed anything. Would definitely rent The Hideaway again on future trips to The Woodlands! Thanks Jane, We hope you come back again. It was our pleasure to meet you and open our home to your family. I met my parents at The Hideaway for a long weekend to attend my brother's wedding. We weren't at the house for a lot of the time but when we were there it was exactly what we needed. Clean, comfortable, and had an adorable backyard for drinking coffee and watching squirrels. Sara was very easy to communicate with and I would highly recommend staying there. Good to know that you could see the simple beauty of our little Hideaway. It is nothing fancy for sure, but we are happy when our guests feel welcome and we hope they appreciate nature in our little private patch of woods. Hope you will come again someday. We run an all electric Taxi company so if you need local transportation while you stay at The Hideaway - call us.